VLA Visit TARC member Richard Davis, W9ZB, was fortunate to be able to attend a tour of the Very Large Array (VLA), one of the world's premier astronomical radio observatories, on November 12. Fortunate because it was a special thing for hams who were going to attend the Socorro, New Mexico Hamfest the next day. Part of the reason for the nice tour was the attendance of the FCC's Riley Hollingsworth (that's him in pictures 5 and 11). He gave a little talk at the hamfest the next day. Picture 1: W9ZB/mobile in front of one of the 25 meter diameter dish antennas. (No transmitting, of course!) The location is on a high (7000 ft. elevation) plain ringed by mountains about 20 miles away in all directions acting as a natural barrier to terrestrial RF QRM. The location is 50 miles west of Socorro. Picture 2: We were allowed to go up in one of the units that was in the shop for updates. This is one of the racks of receivers. The shiny box on top is the old receiver chiller, which had four receivers in it. One of the problems is that if one receiver went down, all four would be out of service for awhile because the chiller had to be shut down. 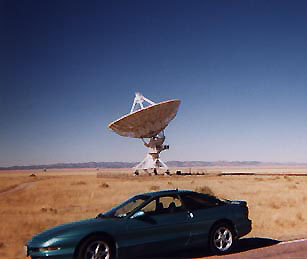 The VLA can observe at various bands between 300 MHz and 50 GHz. Dave Finley, N1IRZ, is the Public Information Officer at the VLA and arranged the tour. That's Dave in the picture. 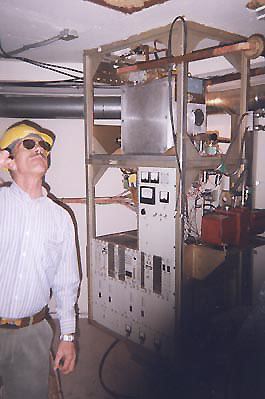 An interesting example of Dave's work can be found at: http://www.aoc.nrao.edu/pr/m87big.html.